3D Pacman - Ever wondered what good old PacMan would be like in the new Millennium? Look! In the Story mode you become a brave hero Pacman who returns to the once idyllic kingdom of Pacland, where the theft of the King's crown has put happy roly-polies on the brink of impending disaster. Your objective is to find the crown while marching through hundreds of galleries, Orks' outposts, towers of weird seers and trying to outwit dancing skeletons, fire-throwing gnomes and other goblins hunting you. Along the way, you must sweep cookies and collect hundreds of new juicy bonuses to increase your score but beware of beer mugs as they give Pacman such a nasty hangover that the guy becomes an easy catch for happy monsters. Should crazied chasers be driving you into a corner, a treasure trunk or a petard may be your last chance for survival. The game offers dynamic and highly addictive gameplay to complement the original scenario and vibrant, rich 3D graphics and visual effects that will attract and entertain PacMan fans of all ages. Play the two-player co-op mode with your kid or friend and you will have endless fun together! This download (3DPacmanSetupTrial.exe) was tested thoroughly and was found 100% clean. Click "Report Spyware" link on the top if you found this software contains any form of malware, including but not limited to: spyware, viruses, trojans and backdoors. Road Construction 1.0 - An inventive and attractive road construction games for players of all ages. 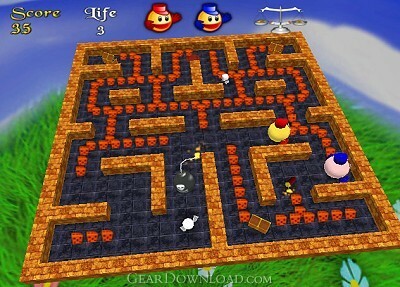 PacShooter 3D - Pacman Download 1.4 - Remake of a popular classic game Pacman. SubmarineS 3.4.2 - Navigate your ship through a minefield. Destroy enemy subs before they get you. Snake 1.0 - Snake is a classic game played by many on cell phones, PDAs, and calculators. BrickShooter Jr. for Mac 1.2.2 - A new variant of the popular and challenging game for strategists of all levels. Breakout Shooting 1.0 - Addicting game based on the non-classic breakout action and pool physics. Submarines for Mac 1.3.2 - Navigate your ship through a minefield. Destroy enemy subs before they get you.